One of the things I remind my friends who are gifted with perfect pitch is that "I can't hear, I can't count and I can't remember". I remind them before a gig that I get along in the aural world in the same way perhaps that a well trained blind person gets along in the visual world. I use a cane, a dog, embossed items to feel and so forth. I use music theory. I have to. You may not need to as much as me or at all even. I have to say though that even my most gifted students many of whom have gone on to achieve wonderful things, do make use of the understanding of music theory. I think at the end of the day every one has to have some grip on the theoretical if nothing else to communicate with other musicians. My perfect pitch buddies all know how to help me with very (and I mean very) few words. Communication between musicians is much of the time achieved by using the language and labelling provided by music theory. It's kind of like being able to give a few simple directions to a stranger looking for the local post office instead of having to "take them by the hand" and physically show them the way. 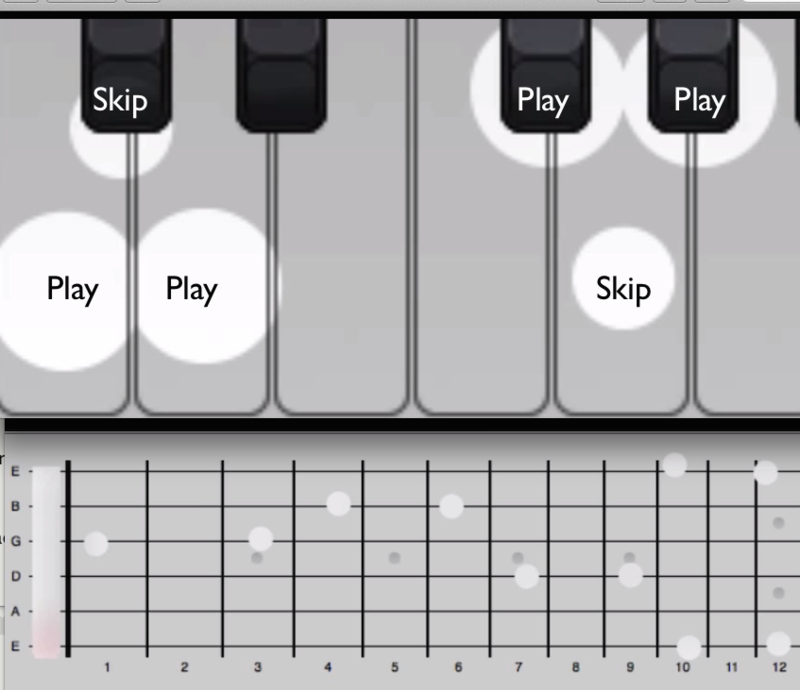 Watch this scary little music theory "scheme of work" video it's only 2 and a half minutes long. This is the pathway to some pretty free feelings of expression as a functioning, communicating musician. Happy Playing! "Half steps" which are also called "semi tones" are the shortest distance between two musical notes in the western twelve tone equal temperament system. Mathematically speaking they are of equal spacing of frequency ratio determined by the twelfth root of two. This makes them symmetrical along a logarithmic scale. 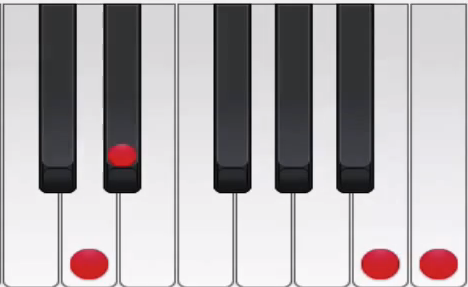 Put simply it is the distance in pitch of one piano key to the next adjacent piano key without skipping or from one fretted note on a guitar string to the next fretted position on the same guitar string without skipping. The intervalic name of any half step is a "minor 2nd" or "augmented unison". For now just think the closest next door neighbour of a note when disregarding the ability to "bend" or "slide" between pitches like a trombone or a human voice. Ok... we can see (and hear) that the half step/semi tone thingy is really just the notes that are closest together in our system of western music. This is a very obvious visually on two of the most popular instruments used today in popular musical genres, the keyboard/piano and the fretted/guitar instruments. We find that it is really just as visually obvious to see and logically obvious to think that two half steps/semi tones will make a whole step/whole tone. All we need to do is skip over a fret (on the same string remember...) or skip over a key and we will have a whole step. A little hint here is that the two notes played will either sound the same or like two different things first of all. That's the best starting point; i.e. same ? or not? If they are not the same ask yourself, does it sound like the beginning to Happy Birthday?...or not? If it does then it is a whole step, the two notes that is to say are a whole step apart. This also called a Major 2nd (Major Second). If the notes do not sound the same but you can't hear the beginning of Happy Birthday they are next to each other, that is to say a half step apart, also called a semi tone or Minor 2nd. Keep your score. Make it a game to improve over time. Just like a video game! They all mean the same thing. The "Heart" part is hard to explain. The by-product of advanced understanding, articulate physical execution and high level aural perception is expressive, soulful, phrasing and dynamics, sensitive, intuitive response and reaction in interactive human musical environments, it may show through in repertoire, improvisation and a creativity of delivery in many ways. By the way there is no one thing here that is more important than the others. What's a Natural Half Step? Music Theory for Guitar Players Part 2 video now. Both pairs are called the "natural half steps". What is a Major Scale? Ok it's time for another cup of tea, a break, maybe a nap or a walk. Get some fresh air and then tinker around on your instrument whether that is a guitar or not. Have a look at the videos again. Have another cuppa or get comfy with your favourite beverage and spend twenty minutes on this guitar fretboard exercise. Just click below to go to Ricci Adams' music theory.net for brilliant free resources for music education. 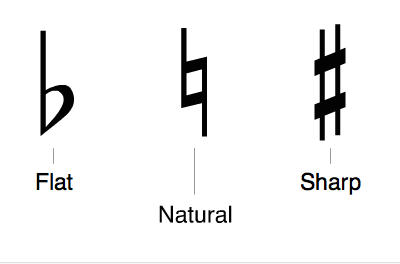 (Some of the graphics on this page are derived from musictheory.net resources-many thanks Mr Adams) Try this fretboard note identification exercise to have a go at identifying the first position notes on all six strings of a standard tuning guitar. If you missed it above you could have a go at the using your ear alone exercise above. What does Thinking in Thirds Mean? What are the Four Types of Triad? If you are local to the United Kingdom West Midlands Coventry Kenilworth Leamington Warwick Rugby Stoneleigh CV8 Post Code area and are interested in tuition feel free to arrange a “First session Free” Guitar or Theory Lesson. Perhaps you just want to chat over a cuppa about the options for your children’s music education. International? Please contact me about Skype lessons. Se habla español – pues bueno un pocito! Never Picked up a Guitar? I promise to use it only to send you Guerrilla Guitar Tactics and Techniques.